FUNERARY KOUROS OF VOLOMANDRA Mid-6th century B.C. National Archaeological Museum, Athens During the mid-sixth century the figure is erect, poised, and yet immobile, an image of energy at rest. One leg stands slightly in front of the other. The arms are attached to the body. 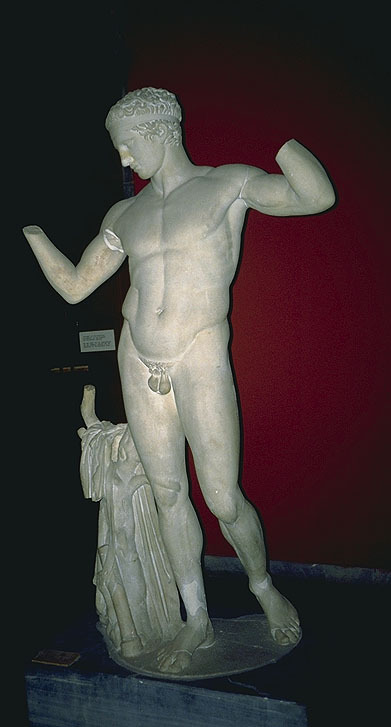 The kouros often stood in a sanctuary or marked a grave. Like the Stele of Aristion it lacks motion. 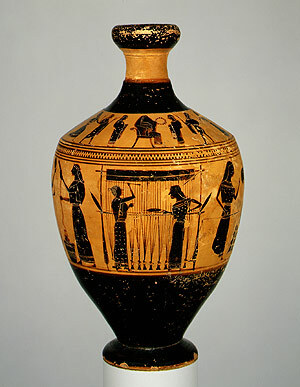 By about 500 BC E, the kouros has moved into the transition between late archaic and severe style. 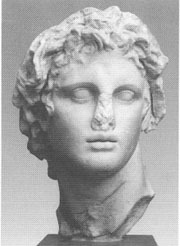 Aristodikos sports the short hair, the unsmiling face and the long, athletic proportions current at a stage in Greek scsculptures it is about to discover contrapposto and the physics of the figure moving naturally in space. 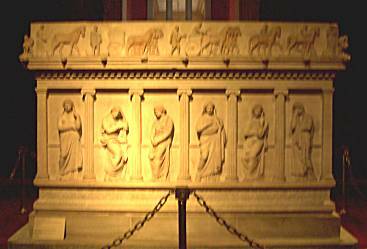 Those are pictures of Alexander’s Sarcophagus displayed now at Istanbul Archaeological Museum. Ahhh, don’t think my mind is wandering. It is not, obviously, Alexander ‘s remains resting there (his tomb has never been found)… This great marble sarcophagus is called the Alexander Sarcophagus because the king is actually represented in the battle scenes we can see along the sides. Dating from the late 4thC, the sarcophagus is regarded as a remarkable work of art, and its carved friezes are admired as being among the most exquisite and delicate examples of Hellenistic art. 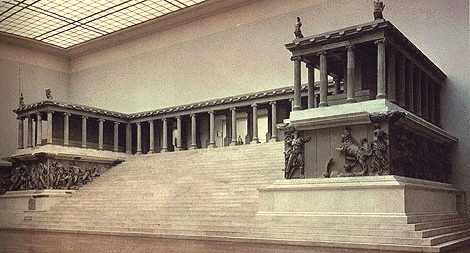 This piece was discovered in 1887 by Turkish archaeologist Osman Hamdi Bey in a royal necropolis at Sidon in Lebanon. From there this and other sarcophagi were carried by ship to Istanbul. 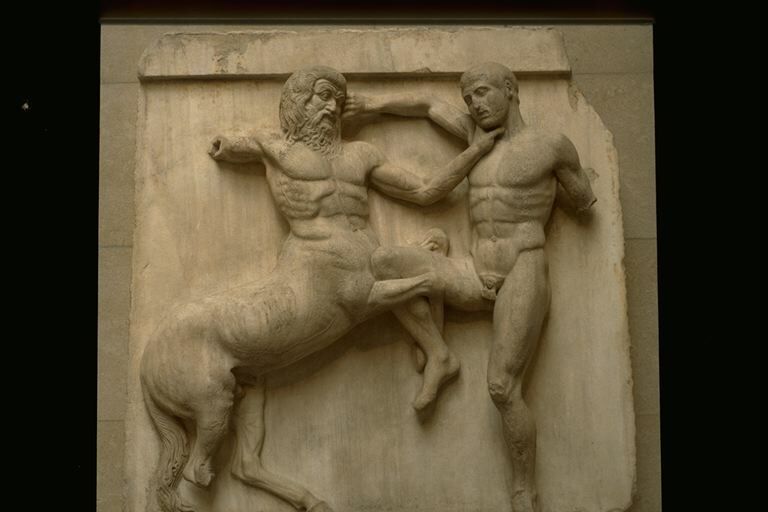 The hunting scene on the sarcophagus in which Greeks and Persians are shown hunting together is a symbol of the way in which Greeks and Persians were eventually united under Macedonian rule. Located on a pine – clad hill and commands a splendid view of the Saronic Gulf — Bay of Ayia Marina, erected 510-490 B.C. The sanctuary may have been site of continuous religious activity from at least Mycenaean times. The deity — Aphia (Aphaea). 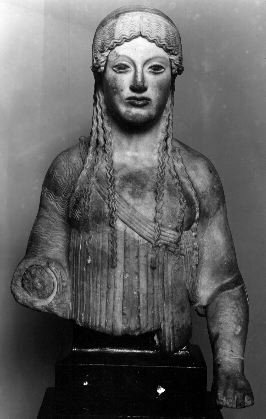 Seem to have been a variant of a Mother Goddess from Crete, Britomartis. Daughter of Zeus and Carme. Devoted to hunt — a favorite of Artemis, In order to escape from the attentions of Minos, who had fallen in love with her, she cast herself into the sea and was caught up in the nets of some fishermen. When one of the fishermen became enamoured of the beautiful girl, she once more plunged into the sea; this time she emerged at Aegina, where she was rendered invisible in a grove. — Aphaea concealed herself in a cave, which is actually situated in the NE corner of the peribolus of the Archaic sanctuary. 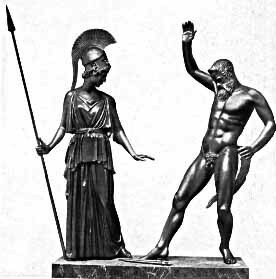 The magnificent bronze statue of Poseidon or Zeus of Artemission (460-450 BC) is one of the favorites. Found some sixty – five years ago off the Evian coast, this beautiful work is awe – inspiring and shows majesty in both posture and expression. Although Myron was known in antiquity for a bronze heifer so realistic that it could be mistaken for an actual cow, it is the Discus Thrower for which he is most famous. 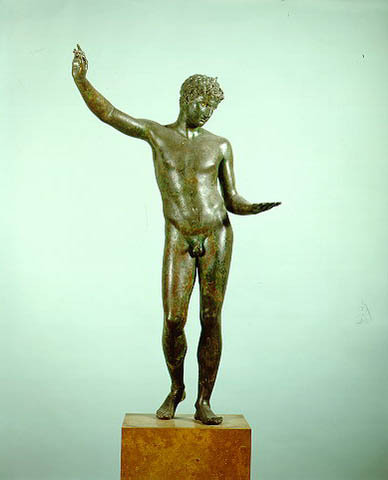 A Roman copy of a mid – fifth century BC bronze, it exemplifies the Greek sense of harmony and balance (rhythmos) which Pliny praises. 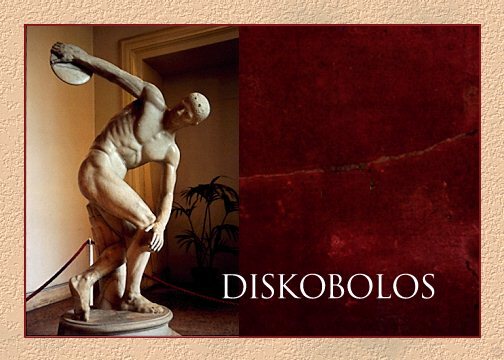 Symmetria is the commensurability of parts, all in balanced and harmonious proportion, which is so well exemplified in the Discobolus. The athlete is in equilibrium, posed just before releasing the discus, the parts of his body in dynamic counterbalance. 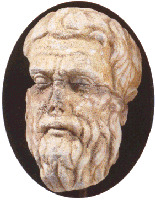 The head, however, seems almost to be a separate bust, so passive is its expression. In his Institutio Oratoria (Training of an Orator), Quintilian, who wrote in the first century AD, compares the rhetorician and the artist, and the distinguishing personal style that makes each unique. Interestingly, his scheme of the evolution of sculpture is different from that of Pliny…. One of the major discoveries of the Italian Renaissance, this sculptural grouping was found in Rome in 1506 in the ruins of Titus’ palace. It depicts an event in Vergil’s Aeneid (Book 2). 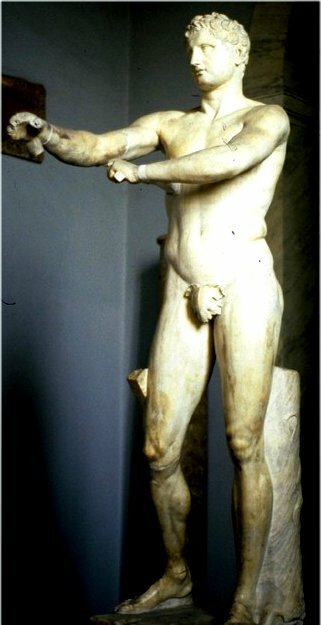 The Trojan priest Laocoön was strangled by sea snakes, sent by the gods who favored the Greeks, while he was sacrificing at the altar of Neptune. Because Laocoön had tried to warn the Trojan citizens of the danger of bringing in the wooden horse, he incurred the wrath of the gods. The grouping was probably designed for a frontal view only. The theatricality and emphasis on emotional intensity is typically Hellenistic Greek–often called Baroque as well. 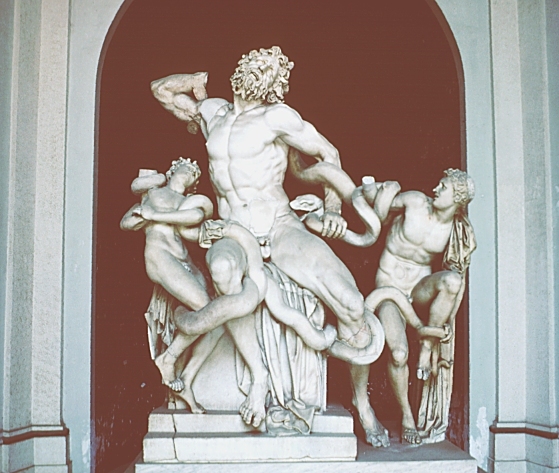 Note the writhing serpents, one of whom bites Laocoön ‘s left leg, and pained expressions. The furrowed brow and open – mouthed pain would be copied by Bernini and Caravaggio in the seventeenth century.